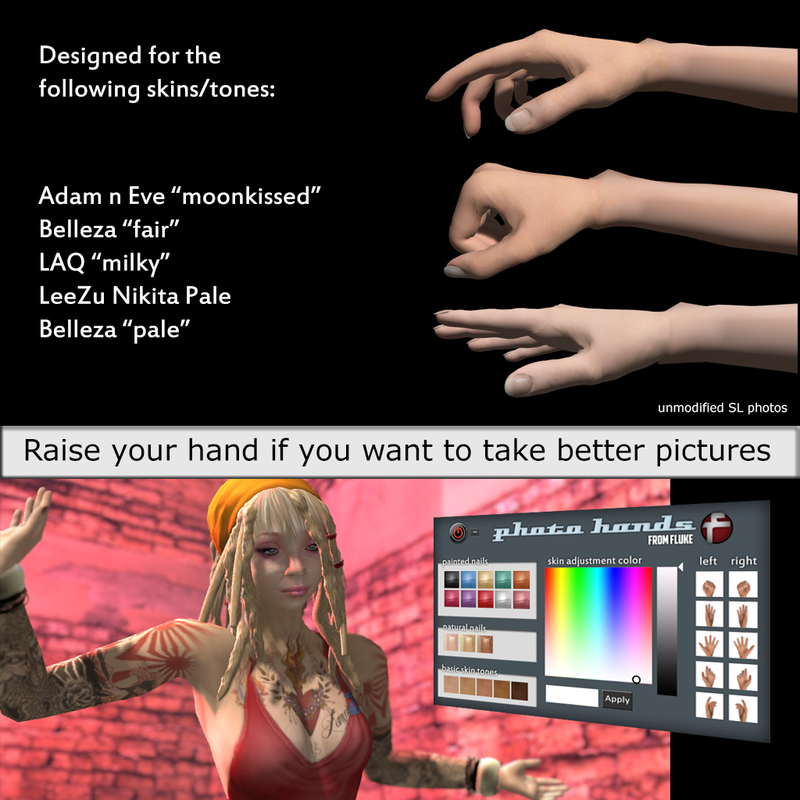 Photo Hands for pale skins! 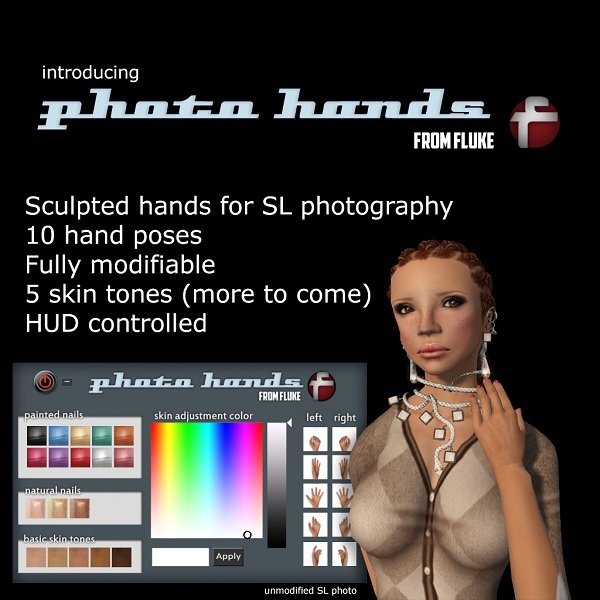 Photo Hands are a set of sculpted hands designed to upgrade your SL photography by replacing the ugly system hands, and opening up new opportunities for stunning model photography. 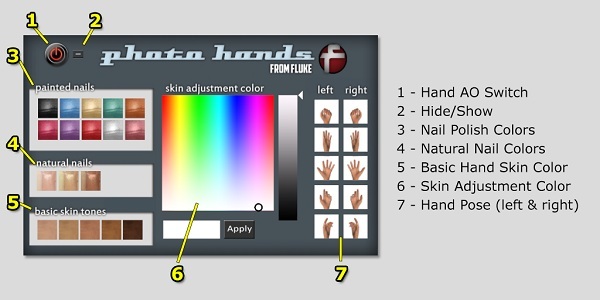 The Photo Hands package consists of two sets of hands, each set having a separate hud and 5 hand poses each. Simply attach the left and right hands, the hud, and wear (or add) the alpha texture. It will take some time to load fully the first time, so patience is a virtue. Once all textures and sculpts are loaded, you will see the HUD attach to the upper left of your screen. 1 – Hand AO Switch. When this is active (green) the hands will automatically switch between poses every 30 seconds. The time to switch hand poses can be changed by saying the number of seconds on channel 101 (if you want to change hand poses every 60 seconds for example, type “/101 60” without the quotes). 2 – Hide/Show. The hud does take up some screen space, so if you want to get it back just click the little minus sign to hide the hud. Click it again to make the HUD visible again. Once you have your hands set up the way you want, you can also detach the hud if you want. 3 – Nail Polish Colors. Click the color you want your nails to be. 4 – Natural Nail Colors. Same as above, only different. 5 – Basic Hand Skin Color: currently there are only 5 basic skin tones available for the Photo Hands (more will be coming soon). You should choose the skin tone that is closest to your skin. If you need to adjust it a little darker, you can do so with the color panel in the center of the HUD. 6 – Skin Adjustment Color. With this color picker, you can darken or add a tint to your skin (you can’t make your skin lighter with this control). To pick a color, click on the color panel on the HUD. The black circle will indicate where you’ve clicked, and the chosen color will fill the box at the bottom. When you have the color you want, click ‘apply’ and it will be applied to the hands. 7 – Hand Pose. 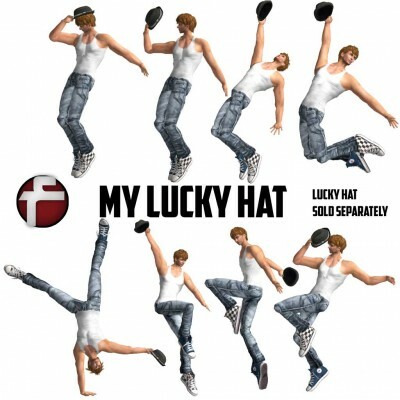 With this, you can control the left and right hand pose separately. Simply click on the hand pose that you want to use. This set of hands has been specially designed to work with these popular skins: Adam n Eve moonkissed (or cool) tone, Belleza fair, Belleza pale, LeeZu Nikita pale, and LAQ milky. As we all know, nothing is perfect. Especially SL! Seams between the avatar and the hands are almost unaviodable. WIth a good skin match, perfect sizing, and the proper lighting, you might be able to hide it pretty well. For those times when perfection does not happen, we’ve included some bangles that are really good for hiding seams. These bangles attach to the forearm by default. If you choose to use your own bangles and they attach somewhere else, you should first make a copy of your bangles and then attach to the forearm. Another excellent way to hide seams is to wear sculpted/mesh long sleeves. 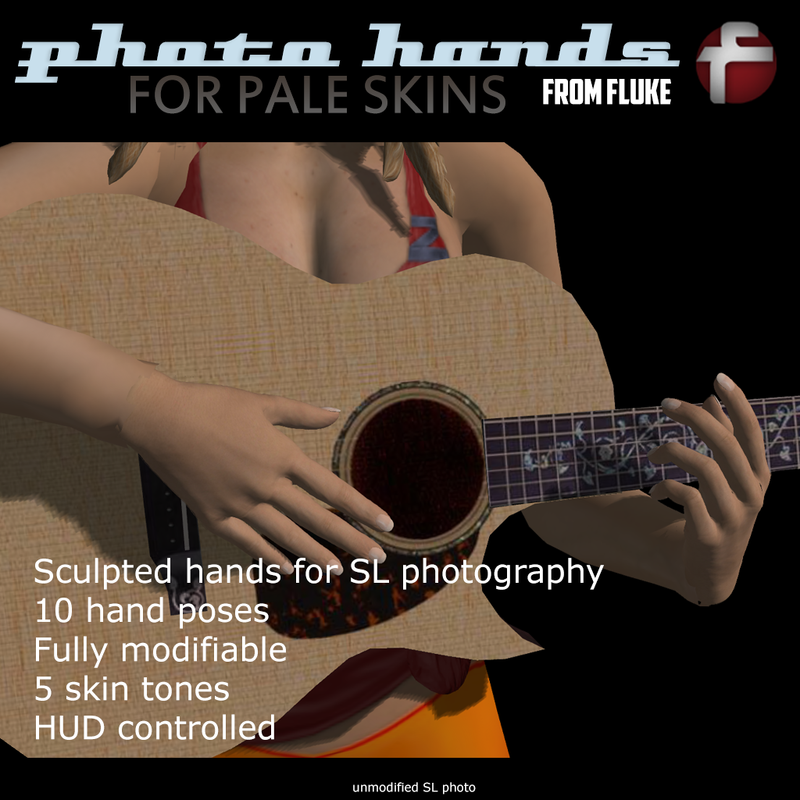 Photo Hands from Fluke are available now at the Fluke main store, and on the marketplace. There is a free demo so you can try them out, risk free. Fluke is happy to be in the first rotation with a bunch of creative and talented people. My entry for the first rotation of Fluid is this dunking booth, with synced poses (including props and sounds). 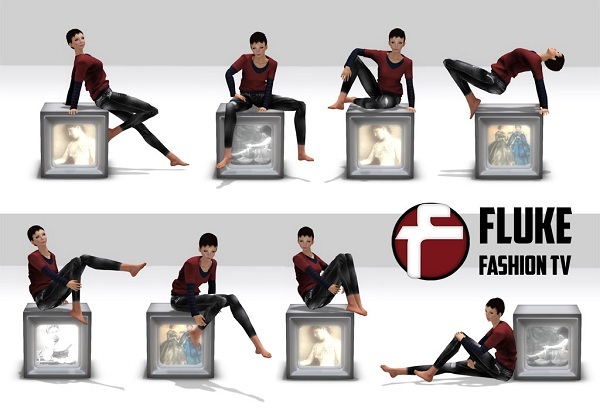 Fluid is a recurring bi-weekly, themed event in Second Life directed to those of us who love poses, animations, props and furniture; creators and consumers alike. Fluid will showcase the talents of 12 pose, animation, prop and furniture makers during the course of these two weeks. Each 2 week period will be considered a rotation. Each rotation will consist of an over-arching theme, which will be dissected into four sub category themes. Designers will choose from one of the four sub-themes. This will result in there being 3 designers in each of the 4 sub-categories. Fluid’s first rotation begins June 15, 2012 (theme: Summer Fun) and runs through June 30, 2012. Theme and designer specifics for the first rotation are below. You can find more information about Fluid at The Ego Co. blog. You still won’t be your best! Just find a Froobatta tree! 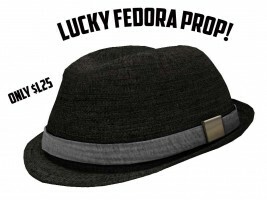 It’ll suit you to a tee! Just roll down the stairs. They think ignorance is bliss. Mental health comes from Froobatta! There’s no chance at all you’ll feel in a funk. 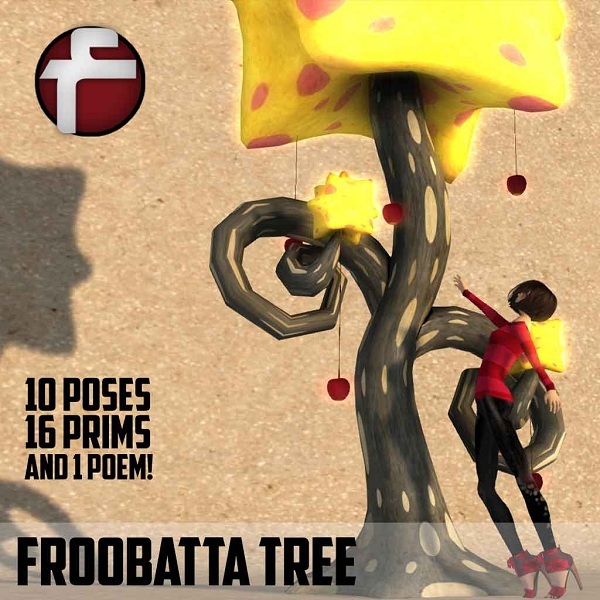 The Froobatta Tree, from Fluke, comes with enough poses for you to gather your bestest friends on the tree. Not all of them, of course, we’re just talking the inner circle of friends. The ones still love you even though they know your deepest secrets. The Froobatta Tree is available for a limited time at The Retreat (at a discounted price) before being turned loose in the Fluke main store. A brand new, yet old, pose prop from the golden age of television. 8 poses and a fashionable glowy idiot box for your photographic fun! A new couples pose is available at Fluke! Stop by the shop and give it a try. While you’re there, don’t forget to grab the group gift that waits for you by the door. It may not be there much longer!